However, with the release of Aung San Suu Kyi in 2011 and the National League for Democracy actively welcoming visitors (“who are keen to promote the welfare of the common people and the conservation of the environment and to acquire an insight into the cultural, political and social life of the country”) Burma is now well and truly on the up as a travel destination and as you read this the Hubby and I will be starting out on our fascinating adventure - travelling responsibly of course and determined to ensure as much of our western pennies goes into the hands of the locals and not the government. I’ll be reporting back on our trip in January. When someone recently asked my how long the flight to Burma is (around 20 hours with stops in Dubai and Bangkok) they immediately followed it up with asking how I cope with long haul flights as I seem to do a lot of them! That’s really not true by the way! The answer to the question however, is that over the years I’ve accumulated a collection of nifty items that make travelling that little bit easier and more bearable and none of them involve anything more than an Economy seat (much to the delight of the Hubby!). So, with Christmas fast approaching I thought I’d share a few of my favourite travelling companions with you as some of them would be excellent as Christmas presents. I find those leather passport and boarding pass holders such a waste of time as there’s never enough room. 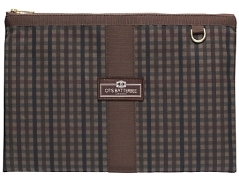 Instead I have an Otis Batterbee Travel Pouch in large, which holds all my (and the Hubby’s) important travel documents as well as my iPad, phone, money, a book, sun glasses and plenty of other stuff all in one handy place. It also (usually) fits in the seat pocket so all the things I need for the flight are in one place and easy to reach. Travelling can be a dirty business and I’m a bit of a clean freak. However, I’d rather not douse my hands with those waterless hand gels that smell foul and feel like they are stripping the skin off your hands. Instead, I invest in Aesop’s Resurrection Rinse-free Hand Wash which is a good smelling, all natural hand sanitiser. You know you’ve been working flat out to get things finished before going on holiday so you’re immune system is shot and the minute you relax you’re bound to get ill, particularly with all those nasties floating around the plane for 20 hours. Well, they say vitamin C in high doses wards off viruses and strengthens the immune system so, as soon as I clear security I get a ton of water and add Emergen-C sachets and then sip the water through the flight. On the plane my godsend are my Bose QuietComfort 15 headphones. These beauties reduce unwanted ambient background noise, so you can hear what you want (the movie) and silence the rest (the babies crying). They’re also good if you pop in some ear plugs and put these over them as you hardly hear the drone of the plane. When it’s time to sleep, I hate those eye masks that you get in your vanity pouch which seem to stick to your face and leave a nasty imprint when you take them off. Instead I pop on my lavender scentedHolistic Silk eye mask which definitely blocks out light and relaxes you mid-flight. Don’t worry, for the men they do a scent free one in very masculine black! Another favourite of mine is my silk filled pillow from Gingerlilly, which is actually designed for baby’s cot but is perfect for travelling adults too. It’s much nicer than those small things you get given on a plane which never smell quite clean! This is also great when you’re staying in a place where the pillow is the thickness of apiece of lino and as hard as a rock! Those were just a few of my favourite things! All there is to say now is Merry Christmas and a Happy New Year. I’m looking forward to arranging lots of wonderful holidays for you in 2013; whether big or small, an adventure of a life time or just a romantic weekend away without the children.